Giovanni Battista Pergolesi (1710-1736) died so young that publishers attributed a great deal of music to him after his death. Inevitably, the list was later pared down as incorrect attributions were examined, most famously the six concertos recorded under his name in the LP era but now assigned to Unico von Wassenaer. In an interesting reversal, the present work originally attributed to him was not published and only rediscovered in 1930 by Hermann Scherchen, who passed over the question of authenticity but praised its beauty. It was ignored until Reinhard Fehling discovered additional performance sources in 2009 that convinced him of its authenticity. 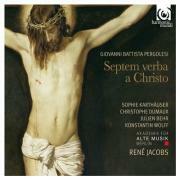 He edited these seven cantatas on the seven last words of Christ on the Cross for Breitkopf, and René Jacobs gave the first performance at the Beaune Festival in 2012, followed by this recording. Each of the seven movements consists of two arias, the first usually sung by the bass (representing Christ), the second by one of the other soloists (representing The Soul). Only five of the arias are preceded by a recitative. By way of exception, the second movement assigns a tenor to Christ’s aria, a departure that remains unexplained. Jacobs has compared the Breitkopf edition with the main source (the performance materials from Kremsmünster) as well as two other manuscript sources (from Metten and Zurich), all supplied to him by Fehling, making some minor changes where he found alternative readings preferable. Among these changes, he reassigned two arias from tenor to soprano (as the Zurich source has it) to balance the work of the four soloists. Jacobs aptly characterizes the work as “not a drama or a Passion, but a meditative, didactic oratorio.” Apparently, nothing is known of the author of the texts, which are no more distinguished than any other late Latin poetry, but they reflect the piety pervasive at the time. Pergolesi was able to draw inspiration from them, nevertheless, and the four soloists do justice to his music. I have not heard any of them before; three are relatively familiar in baroque music among my colleagues, but Julien Behr is a new name who will be recognized as an undiscovered talent in his first recitative and aria, though he has been singing in European operas and concerts since 2009. He is highly accomplished, with a warm voice and an intelligent projection of the texts, a singer whose name will certainly recur here. Pergolesi’s work should enter the repertoire of baroque specialist performers who will find the music rewarding and grateful.